We review many superb “micro-lots” at Coffee Review, small lots of special, extremely refined green coffees. For next month, however, we are reviewing what we are calling “macro-lot” coffees, coffees produced from large lots of green coffee, coffees that are likely to be sold over weeks or months, and represent the sort of staple offerings that anchor a roaster’s regular business, week in and week out. Our general definition of macro-lot is at least 100 bags (roughly) of the same green coffee, owned or contracted for by the roaster. The 100 bags do not need to be held in the roaster’s facility at this moment, and it’s obviously fine if the roaster started with around 100 bags and now is down to fewer. 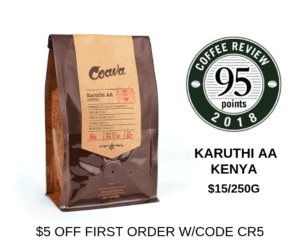 But we think readers may want to know about the great, staple, day-in-day-out dependable single-origin coffees available from their favorite roasters. If you’re a roaster and you have a fine single-origin coffee from a larger lot, please send us a sample or contact Kim Westerman at kim@coffeereview.com for instructions on sending it. We are extending the deadline to February 25.